It's now a thing. Expect to see more treats, on more Fridays, so you can end your week & start your weekend with something a little extra sweet. I decided to go for a classic on this first MacroTreat Friday: the cookie. Really, I mean it didn't take too much thinking, as Fridays + cookies = a fast-track to happiness. 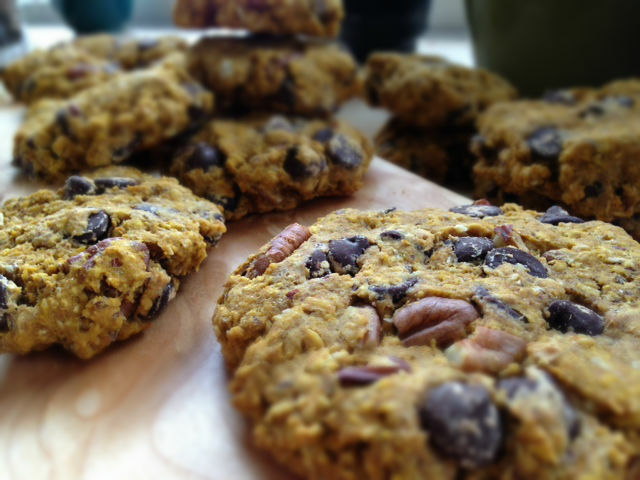 Macrobiotic cookies = an even faster track. 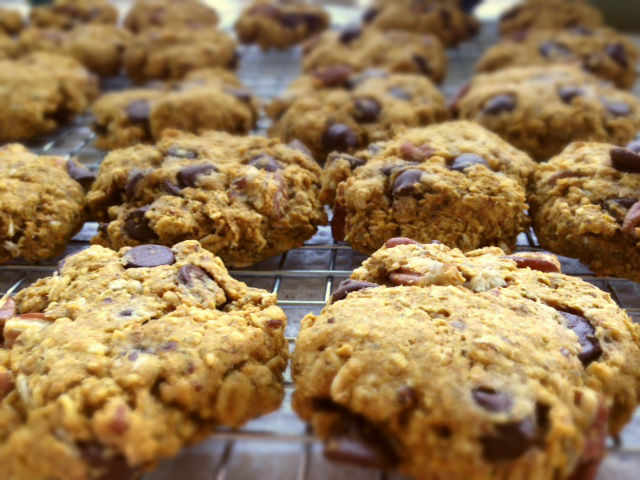 These cookies are more like regular cookies than some of my other recipes, as they use maple sugar in place of maple syrup, and also use flour, not just rolled oats, which gives them a more familiar texture. These cookies are full of chocolate chips, which makes them a pretty decadent treat when paired with the pecans. That being said, they also aren't just like regular cookies, as they don't have eggs, dairy, white sugar (depending on the chocolate chips you use), or white flour in them. So, this means that they are definitely Macrobiotic friendly, just a tad more on the more treaty-side. Give them a try; you won't regret it. 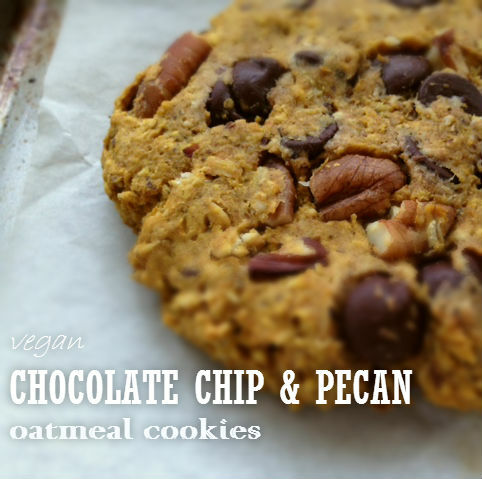 Vegan, whole-grain, chocolate chip & pecan oatmeal cookies. 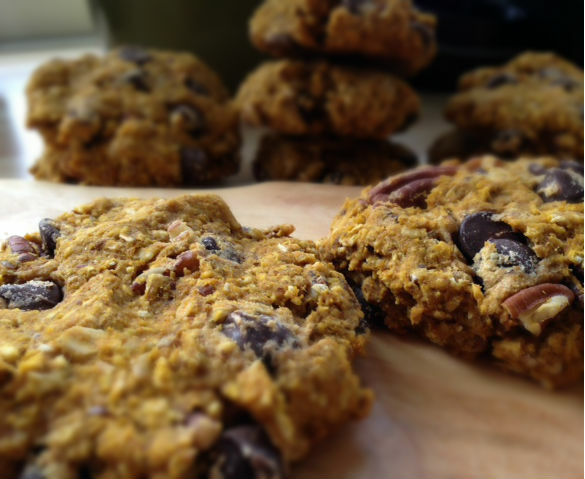 The secret ingredient in these guys is pumpkin, used to replace most of the oil, but without giving any pumpkin taste. Pretty tricky. This recipe makes a lot, about 45 cookies (1.5" diameter). Feel free to play with halving it, or simply enjoy giving some away to friends or stocking up your freezer for those "I.need.a.cookie.now" moments. I made the whole batch because I wanted to use a whole can of pumpkin. Mix the first 4 ingredients together in a bowl, with a mixer, until nicely combined. Add dry to wet slowly, mixing with a spoon at first, and then the mixer. IF it looks way too dry to you, begin slowly mixing in some almond milk. I ended up adding in 1 cup total, when using the sprouted whole spelt flour. Mix in the chocolate chips & pecan pieces. Prepare cookie sheets with parchment paper. Optional step here is letting the dough chill for 30 mins in the fridge first. This can make your cookies rise a bit more. I skipped this step and they still turned out great. Using hands, roll dough into balls, and place on the cookie sheet. Then flatten slightly with your hand or a fork. Bake for 12-17 minutes, depending on the size of your cookies and your oven. I prefer these baked a bit longer, as the pumpkin makes them quite moist, so I baked them all for at least 15 mins. Look to see that they are nice and brown on the bottoms. Let cool, and devour. They will firm up as they will cool. The texture will vary depending on what kind of flour you use (duh). I really enjoyed the whole sprouted spelt flour. These become more cookie-texture and less cakey, as they cool and set up. These cookies are very very modifiable - I have played around with no leaveners at all (still worked! ), and I've also tried using a bit more than the above amounts, all with success. You can try swapping the flour to oats ratio, and play around there too, and with swapping the pecans for other nuts/seeds. Feel free to spice these guys up. I usually throw ceylon cinnamon in, but simply forgot this time. I would imagine you could substitute the coconut oil with a nut butter, and of course you can substitute it with another vegetable oil like sesame or olive oil. I tried freezing these, and they froze pretty well - because they are a bit lower-oil, they won't freeze as well as full-on regular cookies. To make sure these cookies do not get soft when stored, keep them in a glass container, or a tin. I actually just left mine out on the counter uncovered, and they seemed to do just fine. Storing them in a plastic bag is fine, but be warned, they may lose a bit of their cookie texture. Ok friends. Enjoy a cookie, with a cup of tea, and high-five for yourself for making it to the weekend.